[Deuteronomy 4:1]?And now, O Israel, listen to the statutes and the rules that I am teaching you, and do them, that you may live, and go in and take possession of the land that the Lord, the God of your fathers, is giving you. Keep them and do them, for that will be your wisdom and your understanding in the sight of the peoples, who, when they hear all these statutes, will say, ?Surely this great nation is a wise and understanding people.? ?Only take care, and keep your soul diligently, lest you forget the things that your eyes have seen, and lest they depart from your heart all the days of your life. Make them known to your children and your children?s children? Also think about what you can do to help give yourself nuggets of remembrance. Journaling would be one. Sharing stories with one another is another way. Even some out-of-the-box ways are encouraged. 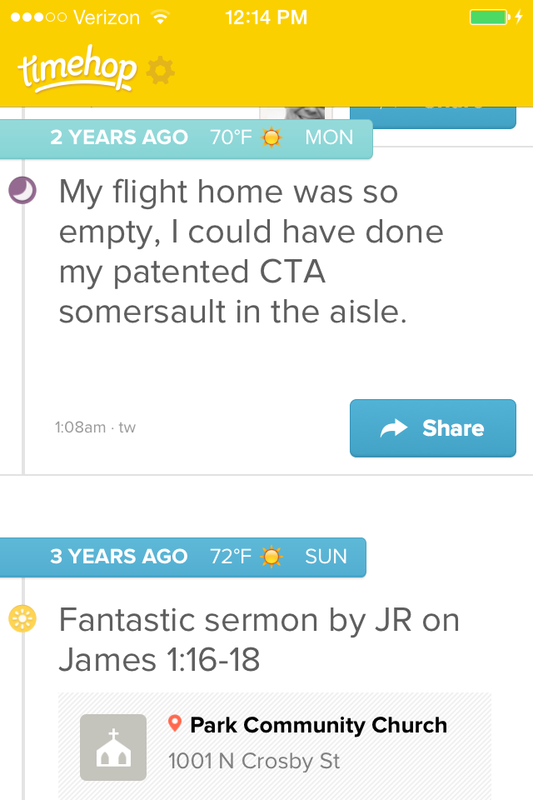 For instance, there’s an iPhone app named Timehop that I check every day. It archives all my tweets, flickr photos, foursquare checkins, and facebook status updates. 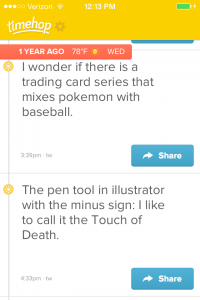 Every day Timehop shows me what I did one year ago, two years ago, three years ago on this same day. 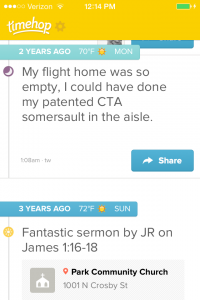 I’d like to start tweeting more about what I’m learning about Jesus and what He does for me, so that one year from now I can be reminded of it via the Timehop app. I’m leading my bible study group’s discussion on Deuteronomy 4:1-43 this week.